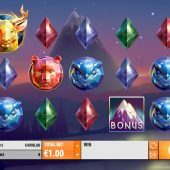 Northern Sky slot from Quickspin takes us on a serene and picturesque journey to Scandinavia where landscapes are peaceful and wild. This part of the world is famous for its Aurora Borealis, more commonly referred to as 'Northern lights'. Tranquil music plays softly in the background and the symbols fall gently into place on a transparent backdrop of mountains and forests. This is a slot for the outdoorsy type, who can’t stand the crash bang wallop of some slots that resemble something akin to the big city. Northern Sky has just 9 paylines, which is not typical for most Quickspin slots. However, it is set over 5 reels and 3 rows, something we are more familiar with. 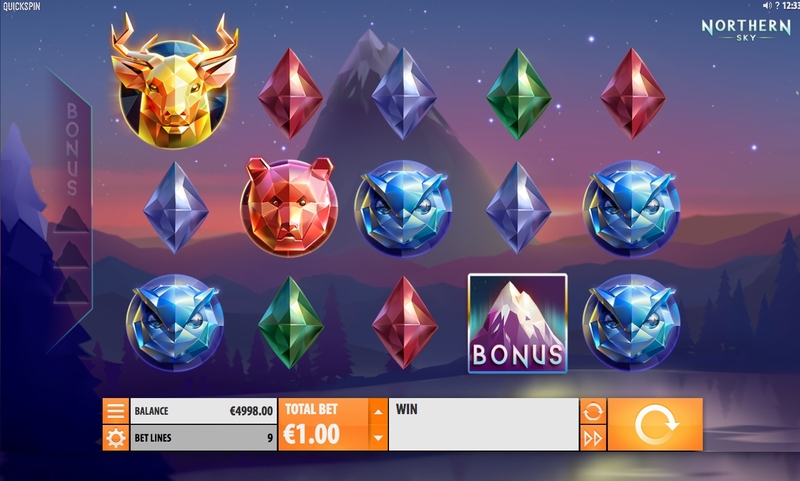 Highest paying at 8.00 coins for 5-of-a-kind is the dear symbol, followed by the bear at 2.00, Fox at 1.00 and Owl at 0.80, the crystal symbols follow, paying between 0.40 to 0.20. Interestingly this game offers no Wilds, but does have bonus scatters for entering a special bonus round, more on that later. A nice feature in the base game is the re-spin, triggered by any winning combination on a payline. The winning combo will then lock and all other symbols will disappear. A new set of symbols will replace them and can possibly add to your current winning combination. The feature ends when no new symbols are added. However, the big difference to similar features in games like NetEnt’’s Jack Hammer is that different symbols can form separate winning combinations. This will make more sense once you play it I think, as its hard to explain. Three bonus scatters will activate the free spins feature, rewarding you with 10 free spins. All the low paying crystal symbols are removed from the reels and higher paying animal symbols replace them. This makes the bonus feature particularly interesting, as the re-spin feature is also in action. There is a potential for over 3000x should you get lucky.